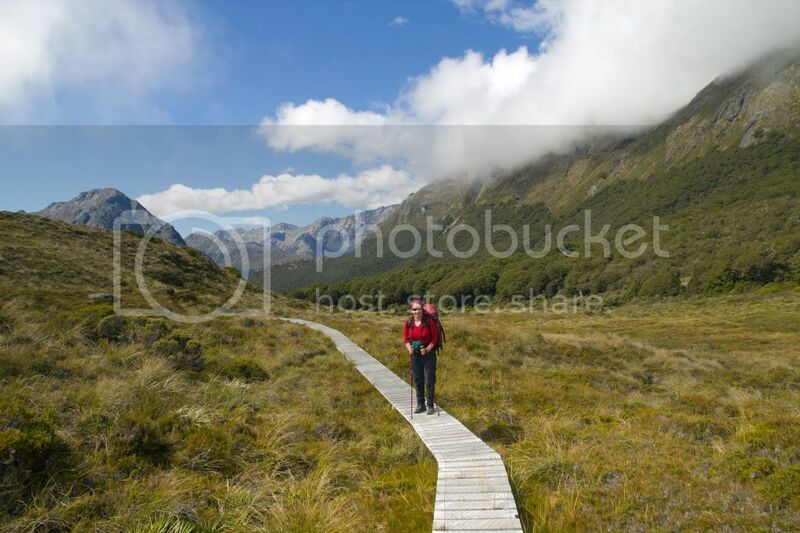 We learned years ago that for Australians bushwalking in New Zealand, overnighting in huts is the easiest option. Certainly you can take a tent – thousands do – but why would you bother? Even in remote areas, there are often huts. Most of them are wonderful homes away from home, cosy, comfortable, and great for meeting people from all over the world. 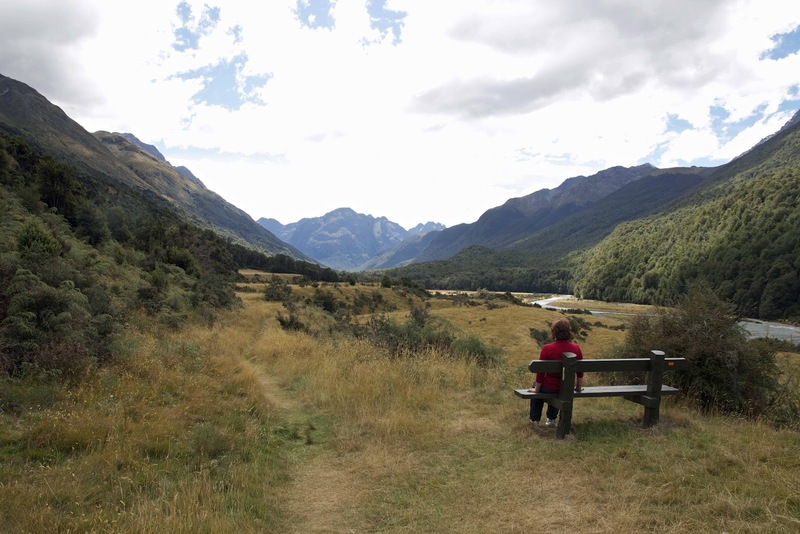 They add a special feel and flavour to New Zealand tramping. Exactly why huts are so plentiful in New Zealand is a long story. Let’s just say that it’s down to Kiwi history: a response over time to the needs of trampers, foresters and hunters in remote places. We could also add that the often fierce weather and terrain make safe and solid shelters a sensible option. What we should NEVER say is that it has anything to do with New Zealanders being a softer breed. That suggestion from an Australian would be taken as an underarm delivery*, even if we could point out that there are such fripperies as mattresses, inside taps and sinks, and even flushing toilets in some tramping huts! This all became relevant to us on the second day of our Greenstone/Caples walk. We had overnighted at Mid Caples Hut, an easy walk in from the track head. But that meant that we still had to reach the Upper Caples Hut – around two hours away – before starting a full day’s walk. So we got away early and eased up the beautiful Caples valley, wandering alternately through beech forest and across open grassy flats. It had rained a little overnight, but now the clouds were shredding, tearing away from the hill and mountainsides as the sun reasserted itself. In near perfect conditions: cool, windless, intermittently sunny, we reached Upper Caples Hut in time for a coffee and chocolate stop inside the hut. Sandflies made that the only sensible option. We met a father and son from the North Island, who filled us in on who else had overnighted in the hut. There were trampers from Canada, Scotland and Israel, some going our way, others heading in different directions. You can read guide books and maps all you like, but until you have done a walk – and quite often afterwards – you only have a subjective, impressionistic idea of the shape of a walk. For the next two hours I was sure we were about to start the steep climb from the upper Caples valley onto McKellar Saddle. And yet we kept wandering up quite gentle gradients, even though we could see the slopes tightening all around us when gaps in the forest allowed. I’m not a big fan of steep climbs, but they do tend to lead you to the best views. And briefly travelling as a quadruped, engaging both arms and legs in an ascent, can spread the effort. McKellar Saddle is just shy of 1000 metres in altitude, hardly high even by Tasmanian standards. But after our early start and around five hours on the track, we were very pleased to climb out of the stunted forest and onto the alpine saddle. The saddle sits near the Otago/Southland border, Otago to the east and Southland to the west. The weather could have told me as much. To the east was blue sky, scattered cloud and sharp mountains. 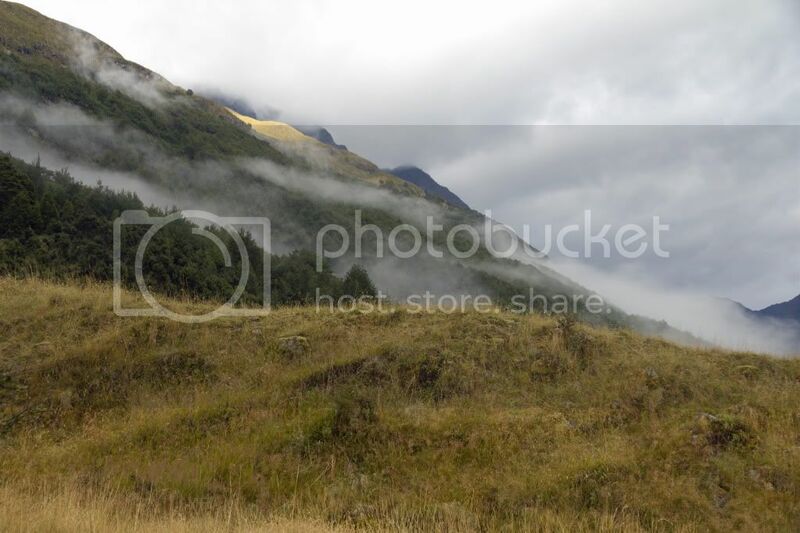 To the west was grey sky, low cloud and just the occasional glimpse of Fiordland mountains such as the Darrans. Ah the Darrans: one day I will see you fully revealed! Still, lunching in the sunshine and facing the beautiful Ailsa Mountains, was no hardship. Nor was the slow wander across this beautiful saddle, enjoying all things alpine for a change. By contrast the sudden descent, on newly made track, was somewhat brutal. We’d been on our feet with full packs for over six hours, and they were not happy with the downhill pounding. Lynne in particular was finding it very difficult, and she eventually made the decision to change out of her tramping boots into joggers. She’d had the suspicion that the boots, despite being lightweight (and expensive, and Italian! ), were too narrow for her feet, and that that was referring pain up to her knees. The relief of walking in joggers was almost instant. It made the long descent and the slow trundle alongside Lake McKellar to the McKellar Hut (which is not actually on the lake) more bearable. All up we were nine and a half hours on the track before we finally reached the hut. If we’d had a tent, perhaps we’d have stopped some time before. But the magnet of the hut had eventually dragged us in, albeit at a stagger. After a rest, a stretch and a wash, it’s amazing how your humanity can return. Add the superb mountain setting, a bit of food and drink, and a handful of fascinating hut companions, and you can start to forget the effort it took to get here. And yes, the mattress helps too!